Text by Marcelle Polednik, Karen Wilkin, Jeremy Gilbert-Rolfe. Edited by Jason E. Smith, Annette Weisser. Text by Susan Stoops, Philip Vanderhyden, David Shapiro, Jeremy Gilbert-Rolfe. The abstract paintings, sculptures and installations of New York–based artist Mary Boochever span a 30-year career spent investigating color and geometry. This first overview of her work includes more than 140 color reproductions. Clth, 8 x 10 in. / 144 pgs / 131 color. Abstract Expressionist painter Michael Goldberg (1924–2007) was a generation younger than the core group of New York School painters--Rothko, Pollock, de Kooning--and while he was frequently classified as a second-generation member of this illustrious group, the designation referred more to the artist’s age than the quality of his paintings. Goldberg’s ouevre is characterized by only one constant: nimble, improvisational reinvention. While he remained deeply committed to abstraction, over the course of his long career--from the 1940s until his death in 2007--Goldberg reconceptualized the visual, aesthetic and material boundaries of abstract painting. 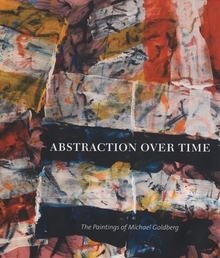 Abstraction over Time includes essays focussing on the artist’s stylistic evolutions while exploring what Goldberg’s lengthy and prolific career can teach us about the significance of abstraction as a vital twentieth-century postwar American Art. Clth, 9 x 10.5 in. / 112 pgs / 60 color. Jacques Rancière (born 1940) is one of the few living French philosophers to have established a significant dialogue with contemporary art. 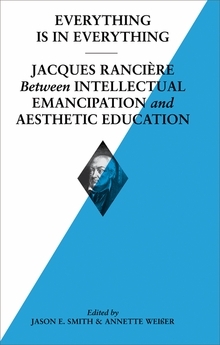 Rancière unites a politicized perspective on art’s ability to rupture everyday life with his influential theorizations of education (The Ignorant Schoolmaster) and politics (The Nights of Labor). His profile has ascended dramatically in the U.S. over the past decade, and this volume considers the continuity of his work across aesthetics, politics and education. With essays by Evan Calder Williams, Arne de Boever, Claire Fontaine, Peter Friedl, Jeremy Gilbert-Rolfe, Maria Muhle, Frank Ruda, Jason E. Smith, Jan Voelker and Rancière himself, this volume asks the question: how might a new model of aesthetic education transform our concepts of art, politics and pedagogy? Paperback, 5.5 x 9 in. / 144 pgs / 19 bw. Artwork by Jim Dine, Jasper Johns, Roy Lichtenstein, Claes Oldenburg, Mel Ramos, Robert Rauschenberg, Larry Rivers, James Rosenquist, Tom Wesselmann. Edited by Germano Celant. 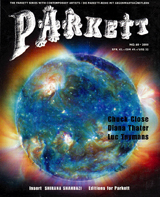 Contributions by Bob Monk. Text by Scott Rothkopf, Jeremy Gilbert-Rolfe, Judith Goldman, Linda Norden, Lane Relyea, Petrus Graf Schaesberg, Rainer Crone, Dave Hickey, David Shapiro. A giant, soft drum set by Claes Oldenburg, a white alphabet by Jasper Johns, a combine painting with radio attached by Robert Rauschenberg, a composition with a halved peach, a Buick and a naked lady by James Rosenquist, rows of Campbell's soup cans by Andy Warhol, pin-up girls by Mel Ramos, and a graphic explosion by Roy Lichtenstein: the works gathered here pack more of a big bang than a pop. 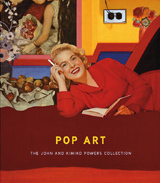 With signature pieces by the movement's stars, the John and Kimiko Powers Collection of Pop Art is considered one of the most extensive in private hands. Accompanied by individual essays on each of the represented artists. Hardcover, 10.75 x 12.25 in. / 144 pgs / 28 color / 15 bw. 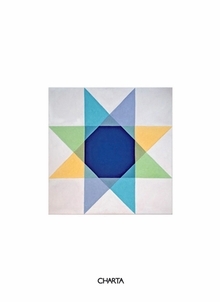 Presenting unique and in-depth collaborations and editions with leading international artists, Parkett No. 60 features Chuck Close, Diana Thater and Luc Tuymans, three artists from very different backgrounds. Contributing writers include Francine Prose and Richard Shiff on Close; Sara Arrhenius, Jeremy Gilbert-Rolfe and Regina Hasslinger on Thater; and Laura Hoptman, Gerardo Mosquera and Hans Rudolf Reust on Tuymans. This issue also contains essays on David Bunn, Jeremy Deller and Paul Etienne Lincoln, as well as a conversation between Chuck Close and Elizabeth Peyton and an interview with Close by Bice Curiger.